Pheromones are signalling molecules that are secreted by an animal. They can be picked up by another animal of the same species and may affect this animal's behaviour. The term "pheromone" is derived from Greek and is made up of two words: "pherein" (transport) and "horman" (stimulate). Pheromones were discovered in 1959 by Karlson and Lüsher. Most research studies focus on insect pheromones. For example, in bees, pheromones appear to play a defining role in social organisation. Mammals also communicate amongst each other using pheromones. There are different pheromones for different signalling functions, such as pheromones for alerting other animals, to mark a territory or to communicate a readiness to mate. There are also pheromones that give calming signals. 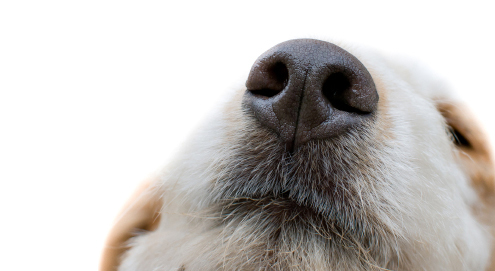 These pheromones can be used for anxious and stressed pets. Dogs with a litter of puppies excrete a soothing pheromone through the mammary glands, the so-called Dog Appeasing Pheromone (DAP). This allows mother and puppy to bond and gives the puppies a safe feeling. Research has shown that the soothing qualities of this pheromone continue to work on older dogs. The pheromone products by Adaptil contain an analogue of this Dog Appeasing Pheromone. Adaptil has a soothing, calming effect and can be used in the event of behavioural problems that are related to fear, anxiety or stress in dogs. The Adaptil diffuser constantly diffuses the soothing pheromones and is therefore very well suited for dogs that behave badly at home. This product can be used in dogs with separation anxiety or when moving house. The Adaptil spray is useful when you want to soothe your dog in a small space, such as a car or kennels. Spraying it in the car before a journey may help to reduce travel-related stress and sometimes even travel sickness. The Adaptil collar is recommended for dogs that show anxiety and stress related behaviour both at home and when out and about. Adaptil is also available in tablet form. These tablets do not contain any pheromones, but contain soothing natural ingredients. They can be used to reduce stress for short periods of time and are very suitable for dogs with a fear of fireworks for example. In order to make their environment familiar and mark their territory, cats rub their heads against objects. Rubbing against objects releases pheromones. Outdoors, cats also mark their territory by scratching and marking with urine (spraying). When a cat shows this behaviour in the house, it often means that the cat is feeling anxious. Feliway uses the soothing effect of the facial pheromones that are released when rubbing against objects. The spray and the diffuser contain a chemical copy of facial pheromones. By putting the Feliway diffuser into a socket at home, the cat will have the benefit of the soothing pheromones all the time. As well as making the cat feel more calm, it will also reduce his inclination to express the unwanted marking behaviour. In this way, Feliway can help to reduce stress-related problems in cats. The Feliway spray can be used in short-term stressful situations. For example, by spraying the travel basket before you take your cat on a car journey or to the vet, you can reduce the associated stress.